I love Emile Hirsch! However, I felt somehow unfulfilled when I saw his official website. No offense of course, that's just my personal opinion, I wanted more. SO on this site is a place for fans to gather and learn about this awesomely talented actor! I don't know what drew you to Emile, but for me personally, it was the fact that he's an attractive teen actor around my age who was in movies that were different than just the regular thing. For those who have not seen "Dangerous Lives of Altar Boys", go ahead and see it and you'll see what I mean. So when I typed out his name in a search engine and I got his official site and an info site, I noticed a major problem-no FAN sites. 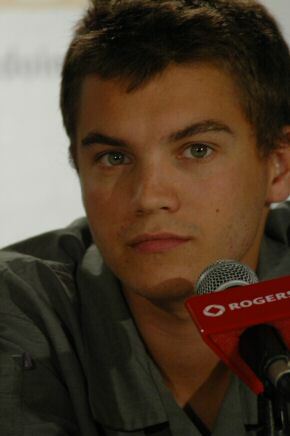 So that's what I'm doing: making the first fan site I know of for Emile Hirsch. Recent Updates? In the E-nteractive Zone! I've made it scores easier to send in your submissions. Go to the E-Zone and check it out! Also, the E-nterviews have been updated as well, so check 'em out as well! Like what you see??? Email me at justemile@hotmail.com and PLEEZ be nice!